Lt. Col. William Cage (Tom Cruise) is a media officer for the U.S. army in Doug Liman’s dystopian sci-fi. Cage finds himself stripped of his rank and headed towards alien-controlled France for a very modern Normandy landing. Live Die Repeat: Edge of Tomorrow is the new sci-fi action flic from Doug Liman – Swingers (1996), The Bourne Identity (2002) – and it’s a war film heavy on contemporary references. The overarching thrust of the narrative involves a modern day reworking of the Normandy landings. Europe however is under the control of an alien species – a modern day Nazi horde. The plot is simple enough. Lt. Col. Cage is an officer who has never seen real combat. He’s effectively shanghaied and sent on what amounts to a suicide mission. Unfortunately for Cage he’s completely under-prepared for war and dies within moments of landing on the beaches in France. This prompts a reset. Cage wakes up at the beginning of the preceding day destined to forever repeat the military invasion. He is now stuck in a time loop and one that seems to resolve each time with his death. The initial first act of the film involves a series of failures on Cage’s part as the allied invasion stutters and falls apart. It seems that the aliens are ready for the Western troops and each and every time Cage lands on the beach they are all wiped out. Effectively it’s Groundhog Day (1993) with guns but the pop culture influences don’t stop there. The beach landings have a marked similarity to the famous one in Saving Private Ryan (1998), the repetitive time loop is similar to Source Code (2011), and the palate is infused with a dystopian tint similar to Children of Men (2006). In fact the alien enemies look like something out of The Matrix (1999) with their biomechanical form. The conflict is well portrayed and it maintains a slick Bourne-esque quality. This is definitely a Blockbuster movie and it’s unapologetically so. In fact this is a Tom Cruise vehicle that we all know well. It follows a traditional three-act structure but there is a gamified element to the narrative that marks it out as unique. The thing that lends The Edge of Tomorrow its distinctive form is the constant restarts, the resets, and the checkpoints. Effectively The Edge of Tomorrow is the best video game movie yet. It’s not an interpretation of a video game, or a remake of a concept originally found on a console. Instead it’s a film that utilises its form to tell a newer story. Cage has to learn and carefully plot his path through the Normandy landings to ensure not only his survival but also the success of the entire military campaign. This is where the film works best and really comes into its own. Effectively Cage is both the player and the subject in an elaborate video game. Every death prompts a restart and he returns to the same checkpoint. There are points then too where Cage gets farther than he has done before and doesn’t know how to deal with the narrative that unfolds. This is the most interesting element of a film that could be considered as traditional in terms of structure and plotting. There are some problems in terms of back-story and character development but those are still problems that plague triple A video games. There are marked similarities to other films too but this borrowing or alluding to other pop culture iconography works because Liman ensures that he adds something new to the equation. Throughout the film Cage has to learn with us. This is an effective trope because it ensures that we’re on the same side as he is and we see the world through his eyes. Often we’re as impotent and uninformed as Cage – for a good period of the film Cage can’t work out the safety on his gun. This ineptitude reflects the box office considerations of The Edge of Tomorrow. Many viewers and critics saw this movie as simply a product of its influences, but that doesn’t really do it justice. Just like Cage has to continuously relive, repeat, and re attempt to beat his alien foes, so does the movie itself deserve another chance. The casting is good (if a touch unimaginative) and Tom Cruise performs well. Emily Blunt stars as Rita Vrataski, a hardened fighter who stands as the exact opposite of Cage’s ineptitude. Again though it’s not really a film about acting and the reliance is definitely on the concept and the set pieces it prompts. Bill Paxton does do a convincing turn as Southern Marine Staff Sergeant Farell with the expected lexicon and the barked tone. But Brendan Gleeson is underserved as the head of the allied forces based in London. Surely it’s an accident, but Irish actor Gleeson heads up the United Defence Force (UDF), an acronym that has other connotations in his home country. 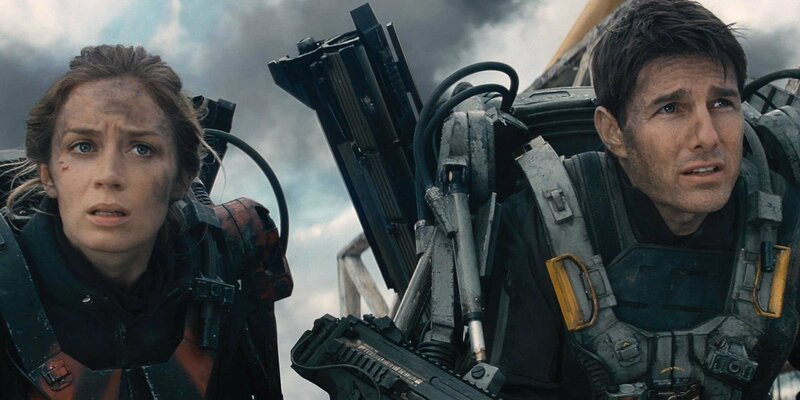 Live Die Repeat: Edge of Tomorrow is a standard action flic with a sci-fi twist. The mixture of the past with the dystopian future makes for an interesting hybrid. The concept is good and the delivery much the same. This is a gamified narrative and one that works best as thrilling entertainment. This isn’t a substantial movie; it’s fun though and not the usual run of the mill-genre-piece that many initially thought it to be.